Second C919 completes maiden flight__Commercial Aircraft Corporation of China, Ltd.
C919 AC102 took off from Shanghai Pudong International Airport at 10:34 on December 17th, 2017. The second C919 aircraft completed its maiden flight at Shanghai Pudong International Airport on December 17th, 2017. 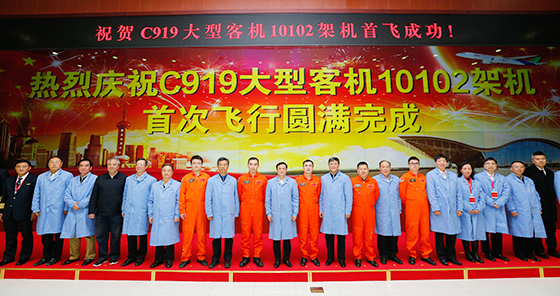 This is an important practical achievement made by Commercial Aircraft Corporation of China, Ltd. (COMAC) in further studying and implementing the spirits of the 19th National Congress of the Communist Party of China (CPC), and an important progress since the first C919 aircraft flew to Xi'an in November. 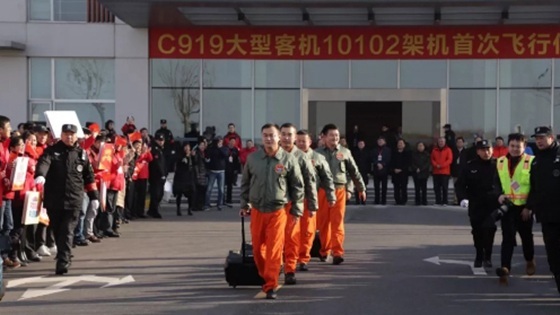 It marks that the two C919 aircraft have entered flight test phase and the program has started a new journey towards comprehensive flight test. C919 AC102 flown by Pilot in Command Wu Xin and Test Pilot Xu Yuanzheng and carrying Observer Zou Lixue and Flight Test Engineers Dai Wei and Liu Lisu took off from the fourth runway of Shanghai Pudong International Airport at 10:34, flew for two hours, and returned and landed safely at 12:34 after completing the scheduled flight test subjects. This flight preliminarily inspected the takeoff and landing performance of the aircraft and the operation of main systems and equipment. Conditions of flap extension/retraction system, landing gear system, and navigation and communication systems as well as the acceleration and deceleration characteristics of the aircraft were inspected during the flight. Mr. He Dongfeng, Chairman and Secretary of the Party Committee of COMAC, Mr. Wang Shixiang and Mr. Sun Weifu, Outside Directors of COMAC, Mr. Yin Shijun, Chief Engineer of Civil Aviation Administration of China (CAAC), Mdm Yang Zhenmei, Deputy Director General of Department of Aircraft Airworthiness Certification of CAAC, Mr. Yang Shuanchang, Deputy Director General of Equipment Industry Department of Ministry of Industry and Information Technology (MIIT), Mr. Hu Yaming, Deputy Secretary of the Party Committee and Secretary of Commission for Discipline Inspection of CAAC East China Regional Administration, Mr. Huang Ou, Deputy Director of Shanghai Municipal Commission of Economy and Informatization, Mr. Liu Linzong, Deputy Secretary of the Party Committee and Vice President of COMAC, Mr. Shi Jianzhong, Vice President of COMAC, and Mr. Wu Guanghui, Vice President of COMAC and Chief Designer of C919 Program, attended the maiden flight activity. According to the program plan, six test aircraft in development batch of C919 will be put into flight test, two of which will be used for ground test. The six test aircraft need to complete more than 1,000 compliance verification tests, and the two aircraft for ground test need to carry out whole aircraft static test and fatigue test. 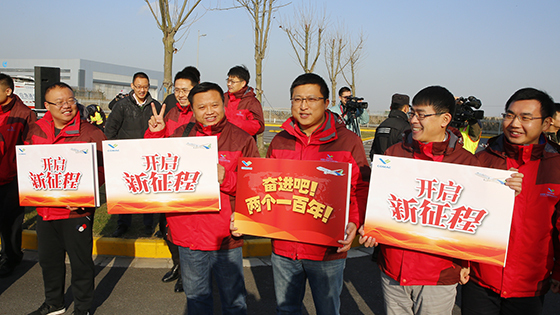 In the next few years, COMAC will join hands with Aviation Industry Corporation of China (AVIC), take the flight test bases of Dongying and Yanliang as the main battlefields, and carry out intensive flight tests at multiple airports throughout the country. This is the first time for China to conduct airworthiness verification of 150-seat trunk liner. 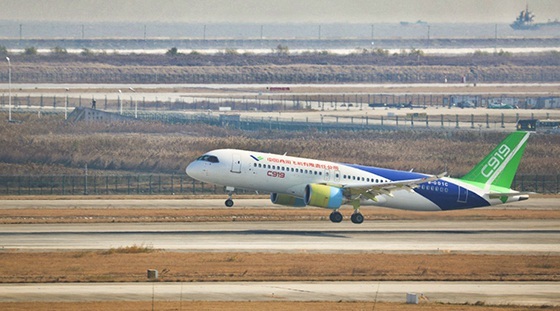 C919 aircraft will face the highest-level verification by flight test in China's aviation industry, and the development of the program will enter the phase of carrying out flight test by multiple aircraft, in multiple places and by multiple teams. There are a series of challenges relating to safety, technology, team work, number of personnel and time period need to be overcome. C919 aircraft is a 150-seat single-aisle trunk liner independently developed by China in accordance with international airworthiness standards. 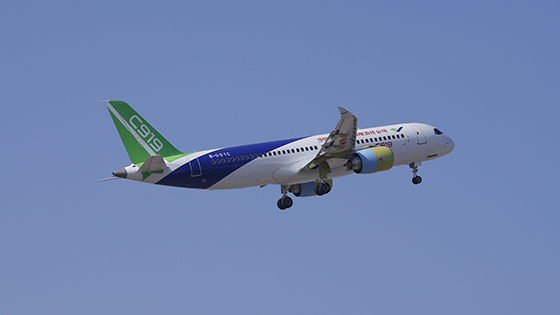 Feasibility study of C919 aircraft was completed at the end of 2008. 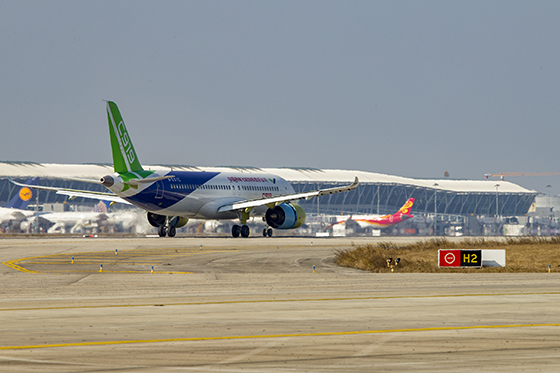 C919 aircraft rolled out in Shanghai in November 2015, and completed maiden flight of the first aircraft at Pudong International Airport on May 5th, 2017. At present, a total of 785 C919 orders have been obtained from 27 domestic and foreign customers. 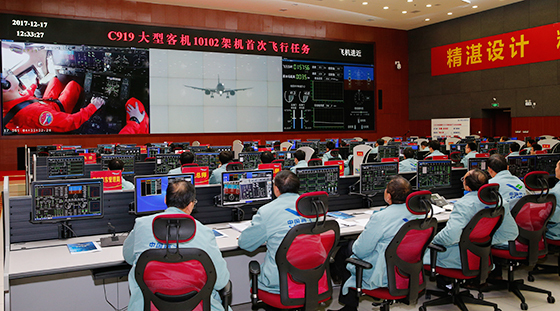 Under the supervision of CAAC, the organization of COMAC and the vigorous support of AVIC, all cadres and workers of C919 program are focused on studying and implementing Xi Jinping Thought on Socialism with Chinese Characteristics for a New Era and the spirits of the 19th CPC National Congress to learn valuable experience from the flight test and certification of ARJ21 aircraft, make innovation in working concept, working pattern and working method, and make unremitting efforts for achieving the flight test, certification and delivery of C919 aircraft and realizing the China dream of the great rejuvenation of the Chinese nation and the trunk liner dream. A group photo of the crew taken on December 17th, 2017. The flight crew departed for maiden flight on December 17th, 2017. Colleagues wished the crew good luck before departure on December 17th, 2017. 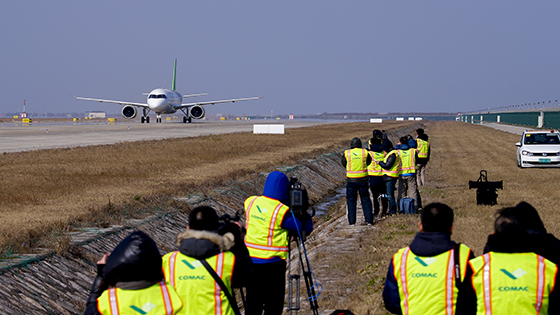 C919 AC102 landed successfully at 12:34 on December 17th, 2017. A photo of the command hall taken on December 17th, 2017.